I subscribe to Runners World Magazine - mostly for the voyeuristic pleasure I get from reading about how much people love and are addicted to running and seeing how awesome really fit runners look. Every few issues there are articles that discuss the pros and cons of group vs solo running. The findings are what you would expect - running with a group increases your accountability, can push you harder, and can be extremely social. Running solo increases your flexibility (i.e., you can run whenever you can) and provides more of that meditative escape that many of us cherish about our runs. Although I admit I usually have some of my best runs while running with others, most of the time I run alone - primarily because I am just trying to fit it in when and where I can. But also because, with so many other stresses in my life, I want to be able to run as long and as fast (slow) as I want on any given day based on how I feel and don't want the added stress of trying to match what I need with someone else's agenda. Get a Great Jogging Stroller. For single kid runs I use the BOB Revolution, which I firmly believe is the best jogging stroller out there in terms of nimbleness, comfort and speed. When I have both kids I use our Phil & Teds Explorer. Although this stroller feels heavier and more clunky than the BOB, I do like the single file aspect of this stroller. It is easier to maneuver through tighter spaces and there is less wind resistance than the side by side options. It also converts to a single stroller super-easily so is great for traveling to give you options. Keep it Short and Interesting. Unless I have timed it over nap time, I rarely schedule a run with the kids that is more than 5 miles long. When I do have them along I pick a run that is relatively flat and on a smooth surface, and that has a lot to look at (either people or nature watching). This keeps them safe, comfortable and engaged and we can chat about what we see as we cruise along. Pack Snacks and Diversions. I never go anywhere with the kids without snacks and water or milk for them. I usually don't offer it to them unless they ask or are getting restless (i.e., I want to avoid Pavlov's dog syndrome) but having a nice little something to munch on keeps everyone in a good mood. I also pack books, toys and lovies and as a last resort I am not afraid of busting out the iphone to keep it going smoothly in the homestretch. Consider it a Full-Body Workout. 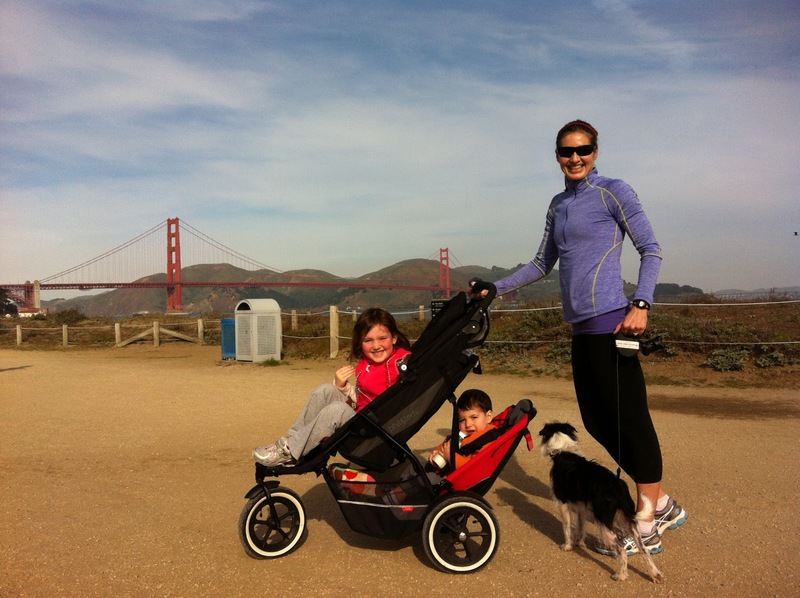 When I first started running with the jogging stroller it felt extremely awkward. I remember complaining to my more experienced parent-runner friends about how weird it felt and they assured me that while it may never feel "great" you get used to the modified stroller-pushing gait. I will say that this is very true. The bonus is that it is indeed a full-body workout, especially on the hills or in the wind. Take it for what it is and enjoy. Get Used to the Peanut Gallery. Even in the fit capital of the world here in the SF Bay Area people will stare and comment as you run by, especially when pushing a double. Some super competitive people (read - men) will also feel the need to race you or speed up when you pass them. Let it go and move on.